Credit : Courtesy the artist. Credit : Courtesy the artist. Photograph Thomas Mayer. Credit : Courtesy the artist. Photograph Bruce Traynor. Credit : Courtesy the artist. Photograph Nadia Otshudi. Credit : Courtesy the artist. 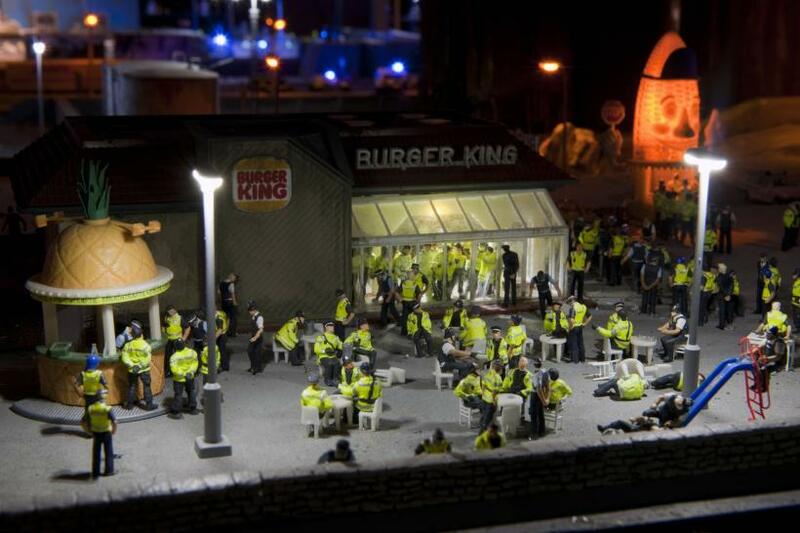 Photograph Jimmy Cauty. 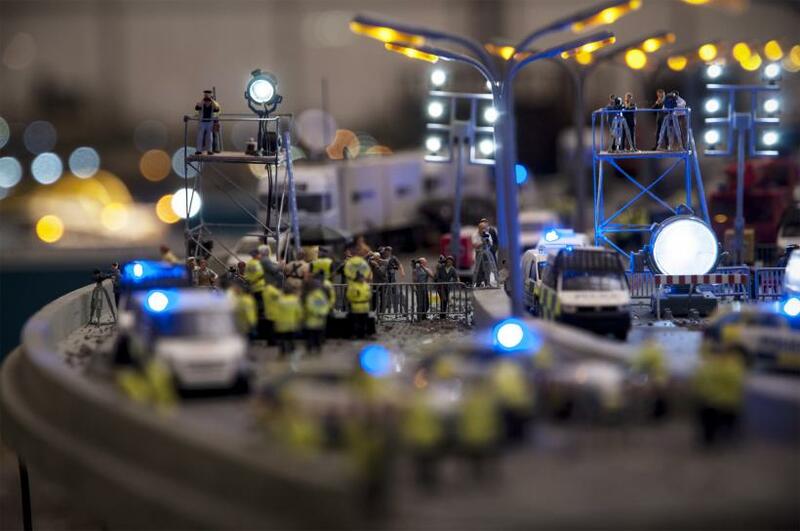 Jimmy Cauty is an artist who is well known for his nonconformity. 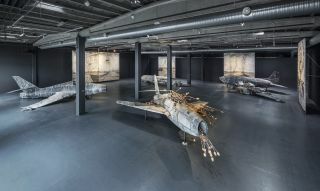 Following the disbanding of their group The KLF, Jimmy Cauty and Bill Drummond staged many high-profile art events under the moniker The K Foundation. The most famous and most highly-criticised of these involved the duo burning a million pounds. 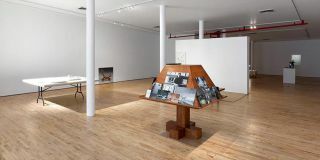 His new work ‘Aftermath Dislocation Principle’ elaborates on the storm in a teacup idea that he explored so expertly in his ongoing ‘Riot In A Jam Jar’ series. 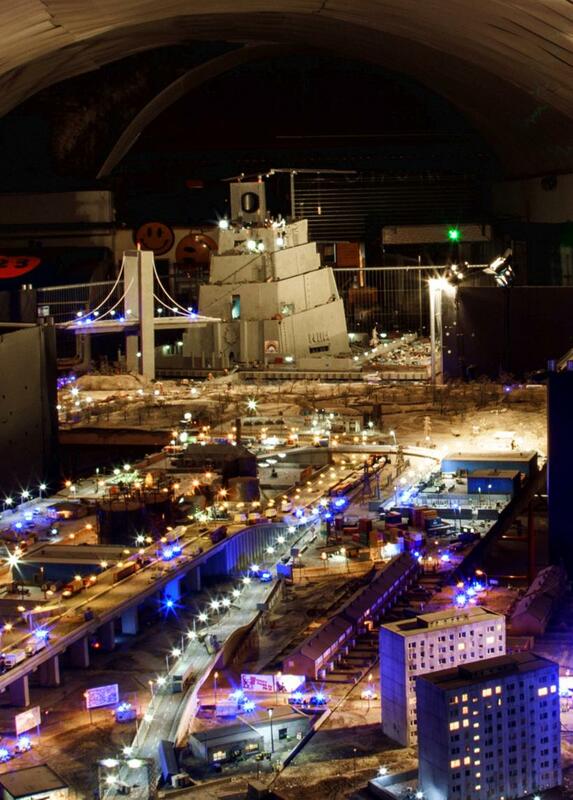 Executed in 1:87 scale, a dystopian model world is touring the country housed entirely within a 40-foot shipping container, stopping off at over 30 iconic sites of historical riots. 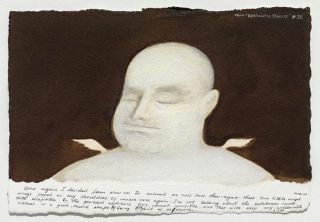 As well as this, two smaller works will be displayed in the Royal Academy summer exhibition and at Glastonbury Festival. 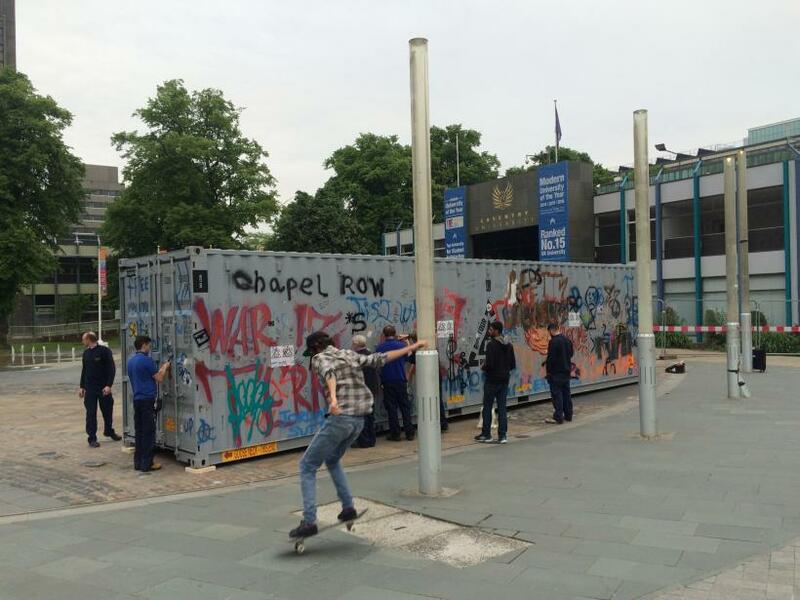 The scene within the container appears as if it is moments after a gigantic riot or apocalyptic event. It is, however, entirely sans-rioters. It is if the rapture has occurred and only the sinners remain. 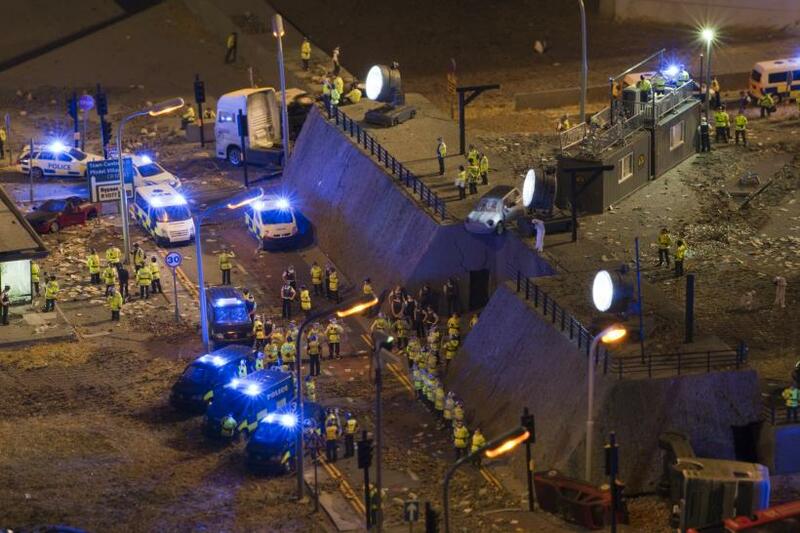 Hundreds of bewildered police officers survey the scene and begin to plan how society will be rebuilt, many of them standing around idly as if entirely superfluous. In what seems to be a comment upon the Orwellian ‘police state’ that we find ourselves in, Cauty has presented to us an enclosed scene that we look upon through literal peep holes. These peep holes are distributed along all four sides of the container in such a way as to give the impression of bullet holes, and from the inside appear on the interior wall as stars across the night sky. As well as the blue lights and sirens, officers and detritus, there are many advertisements for large companies such as Tesco, Burger King, and the payday loan provider Wonga. The inclusion of these no doubt acts as a pejorative comment on consumerism’s negative effects. Perhaps it is the influence of large companies that prey on our insecurities and compulsions that have destroyed society. 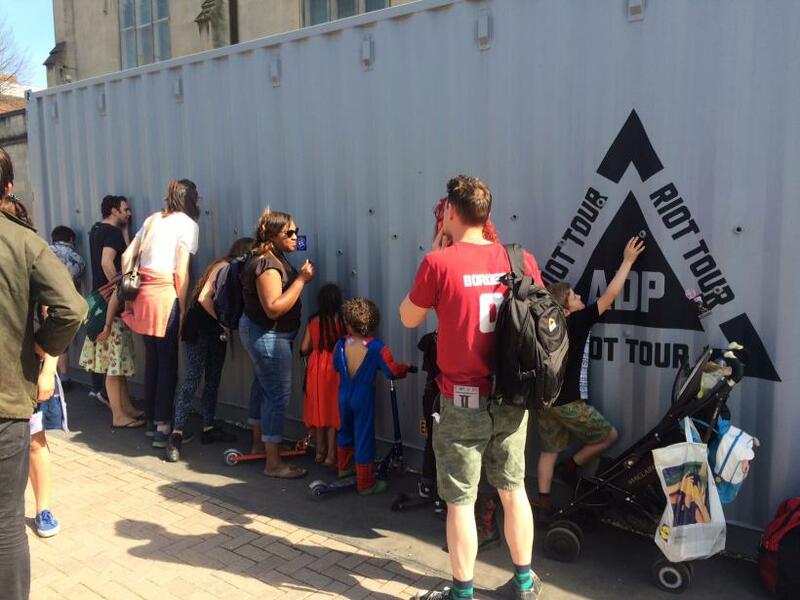 Travelling round the country, the work will make pilgrimages to sites of historical civil disobedience, such as Toxteth, Handsworth, Brixton and Orgreave. In every town or city the work visits, pamphlets will be distributed that remind the public of previous important acts of insurrection that have occurred there throughout history. The village of Orgreave in Sheffield, the site of the notorious fracas that happened as a result of the 1984-85 miners’ strike, is to host the work. 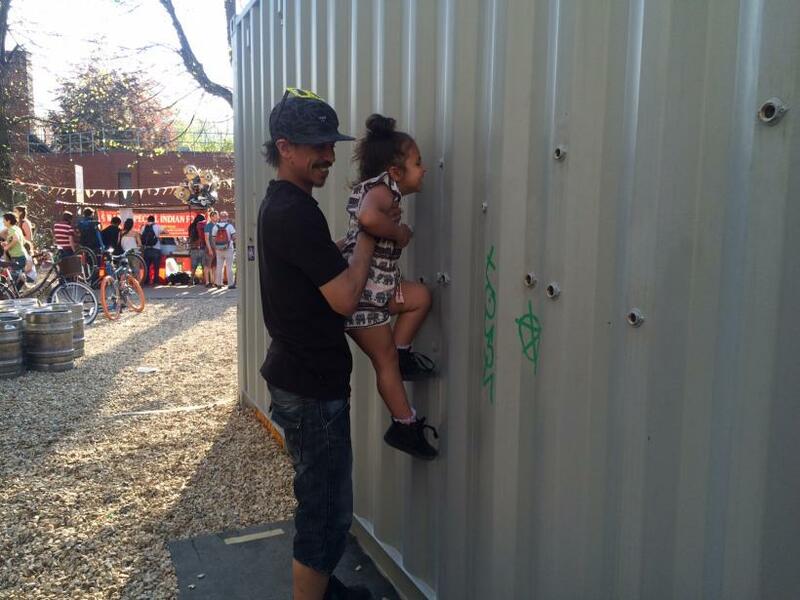 Jeremy Deller, who in 2001 reenacted the battle for a Channel 4 documentary, also supports the project. Around the country, various other events will take place around Cauty’s project – senior citizens will knit police helmets and school children will make their own models. This work is a powerful homage to the challenges that British society has faced in the past, and is particularly poignant given the current state of political unrest post-referendum. 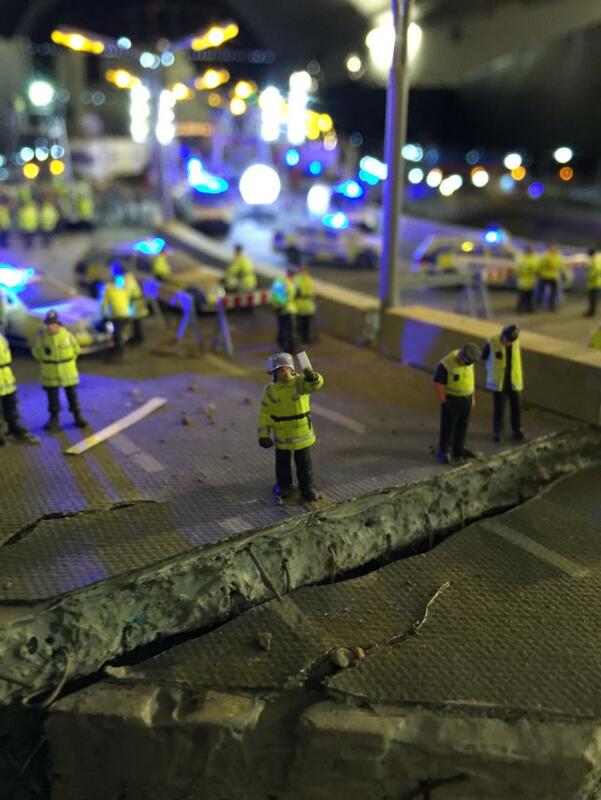 Cauty’s project is a reminder that the government serves the people and that if we are at all discontented with the way they are working we have means at our disposal to take back control. Though not actually compelling us to revolt, the ‘Aftermath Dislocation Principle’ shows that we must not suffer despotism or corruption in silence.